Originally, this was quite an interesting item which shows that at the end of December 1918 it was possible to send a Telegraphic Money Transfer from the small shtetl and town of SOLOBKOVTSI [ now Ukrainian Solobkivtsi] in Podolia to Kiev. The franking was probably provided entirely by Trident-overprinted adhesives. It looks like there were four rubel values and one kopeck value on the front. They have all been peeled off. 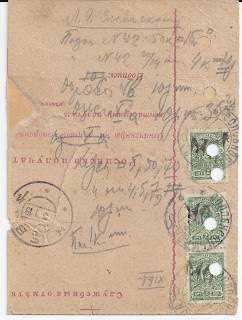 Someone has used the back of the card to scribble notes about various stamps which may be ones which were harvested from the front. Someone has also done a bit of crude repair work, covering up two holes and a large tear with a bit of brown paper. 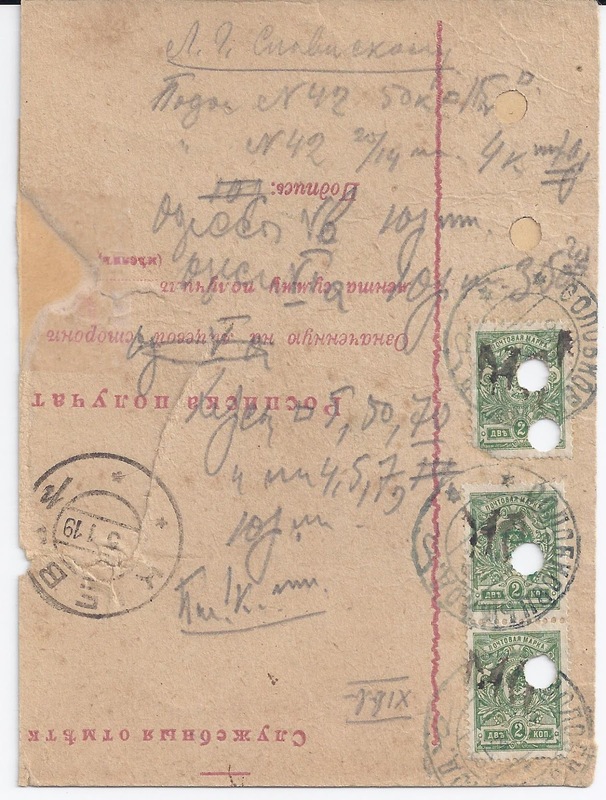 When I look at what I am left with, it is tempting to go on harvesting: to cut out neatly a piece with the three stamps, preserving Bulat’s note. It would show three strikes of a scarce cancel. 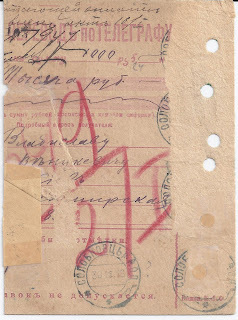 The remains of the body would then show one good strike of the cancel and a Kiev cancel which might be worth 50 cents if I could find someone in search of the Podolian postmark. But should I deliver this coup de grace?